The Oregon State Beavers swept the season series against arch-rival Oregon for the second straight season after a 10-0 non-conference shellacking of the Ducks Tuesday evening at PK Park. It is the first time OSU has swept the series back-to-back since the 1922 and 1923 seasons. What had been a scoreless pitchers’ duel through four innings got away from the Ducks after the 3rd-ranked Beavers plated a run in the fifth then helped themselves to an 8-run sixth, and ended the rivalry debate on emphatic terms for another season. James Acuna was the hardest hit of seven Oregon pitchers, getting tagged for six runs although the loss fell to Cullen Kafka (3-1) who deserved a better fate after scattering four hits and striking out five in his 4.2 innings work. 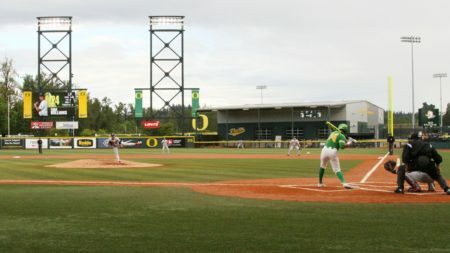 Oregon returns to conference play on Friday, hosting the Utah Utes for a three game series. First pitch is set for 6:00 pm. The post Beavers Complete Season Sweep With 10-0 Win at PK Park appeared first on DuckNews.com.